The Great East Japan Earthquake On March 11th, 2011, the devastating earthquake and tsunami hit the Tohoku region of Japan, leaving hundreds of thousands people still without permanenT homes to this day. At the 2011 Japan Day event, we collected donations at our Charity Tent to be sent to the affected area to give a strong message of support by saying “Ganbare! JAPAN!” throughout the event. In exchange for these donation, donors were provided with a Japan Day Original T-shirt as a thank you gift. The T-shirt design featured the Japanese writing of the message “Ganbare! 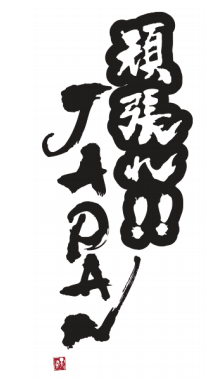 JAPAN!,” drawn by the 2011 Official Artist, TEN-YOU, a master calligrapher. The total donations raised at the Japan Run held on Sunday, May 8th, and the Japan Day Festival on Sunday, May 22nd, were over $48,000. These donations were sent to the Japanese Chamber of Commerce and Industry of NewYork and The Nippon Club’s 2011 Northeastern Japan Earthquake Relief Fund and Japan Society’s Japan Earthquake Relief Fund. The year 2016 marks the 5th anniversary of the 3/11 disaster. Over the past 5 years, provided with such generous support and contributions, both financially and mentally, from all over the world. The United States remains one of the many countries that actively supported the relief efforts in Tohoku. Japan Day took this opportunity to show our gratitude for the tremendous support we received from Americans including New Yorkers. On the day of the event, Japan Day honored three entities/individuals for their great efforts and dedication to supporting the reconstruction of the affected areas. Launched on March 12, 2011, one day after the Great East Japan Earthquake, Japan Society’s Japan Earthquake Relief Fund has received more than $14 million from nearly 24,000 individuals, corporations and foundations. Contributions come from all 50 states and nearly 60 countries around the world. One hundred percent of the fund goes directly to support people affected by the unprecedented triple disaster—earthquake, tsunami and nuclear power plant meltdown. Sixty-six grants totaling $13.95 million have been awarded to 44 organizations in support of immediate relief, economic and community revitalization, business and social entrepreneurship, healthcare, including mental healthcare, youth and education, and arts and culture. Five years have passed since 3.11, and many are still working hard on Tohoku’s long-term recovery. Japan Society remains committed to the region, and continues to accept contributions. Japan Society is an American nonprofit organization supported by individuals, foundations and corporations that brings the people of Japan and the United States closer together through mutual understanding, appreciation and cooperation. More than one hundred years after the Society’s founding in 1907, its goal remains the same—the cultivation of a constructive, resonant and dynamic relationship between the people of the U.S. and Japan. Today, Japan Society has evolved into a world-class, multidisciplinary hub for global leaders, artists, scholars, educators, and English and Japanese-speaking audiences. At the Society, more than 100 events each year feature sophisticated, topically relevant presentations of Japanese art and culture and open, critical dialogue on issues of vital importance to the U.S., Japan and East Asia. The TOMODACHI Initiative is a public-private partnership, born out of support for Japan’s recovery from the Great East Japan Earthquake, that invests in the next generation of Japanese and American leaders through educational and cultural exchanges as well as leadership programs. TOMODACHI seeks to foster a “TOMODACHI generation” of young American and Japanese leaders who are committed to and engaged in strengthening U.S.-Japan relations, appreciate each other’s countries and cultures, and possess the global skills and mindsets needed to contribute to and thrive in a more cooperative, prosperous, and secure world. The TOMODACHI Initiative is led by the U.S.-Japan Council and the U.S. Embassy in Tokyo, and is supported by the Government of Japan, corporations, organizations and individuals from the United States and Japan. Visit us at www.tomodachi.org. In the aftermath of the Great East Japan Earthquake of March 11, 2011, the United States military and Japan Self-Defense Forces worked together successfully in Operation Tomodachi to provide immediate humanitarian relief to the Tohoku region. Sooner after, Mayor Futoshi Toba of Rikuzentaka asked Ambassador John Roos, former U.S. Ambassador to Japan, for support in giving “hope, future and dreams” to young people. Building upon the cooperation and spirit of friendship between the two countries, the TOMODACHI Initiative was established. The TOMODACHI Initiative offers just what Mayor Toba requested: hope for a better world; possibilities of a brighter future; and support to realize all kinds of dreams, from becoming an astronaut, to performing at the Lincoln Center, to founding a business. Since 2012, the TOMODACHI Initiative has provided educational and cultural exchange opportunities to over 2,600 young people in Tohoku. Moreover, once participants take part in a TOMODACHI program, they become part of the TOMODACHI Generation, an alumni community of young American and Japanese from diverse backgrounds who are invested in U.S.-Japan relations. They are provided with additional opportunities that give them the experiences, skills, and confidence to achieve their dreams and contribute to a better world. Hideki Matsui has been enthusiastically working to support the reconstruction of the disaster-affected area ever since the earthquake and tsunami happened. He has always been conscious about what he can do to help the recovery of the affected area. This desire to help is also what led Matsui to ask for support from Americans, who know him as a Major League Baseball player. Matsui has led a funding drive and made charitable donations to The Japanese Red Cross Society and has been involved in various baseball-related charity events. In November 2014, he participated in the Giant vs Hanshin Old-Timer's Game in Sendai to support the recovery efforts for the disaster. In March 2015, he also participated--along with Derek Jeter--in the “Support Our Kids” project, a charity baseball game for children in the region hit by the earthquake and tsunami. Matsui began his professional baseball career in 1993 with the Yomiuri Giants, leading the team to three Japan Series Championships, while being an 9-time All-Star and 3-time League MVP. In 2002, he signed as a free agent with the New York Yankees and was a two-time All-Star during his 7-year pinstripe tenure. His stellar Yankee career culminated in a championship in 2009 while becoming the first ever Japanese player to be named World Series MVP. He further played for the Angels, Athletics and Rays, then announcing his retirement in December 2012. In 2013, he received the People’s Honor Award in Japan and was officially retired as a member of the New York Yankees and the Yomiuri Giants. Matsui currently serves as Special Advisor to the GM for the Yankees, helping young players reach their potential.